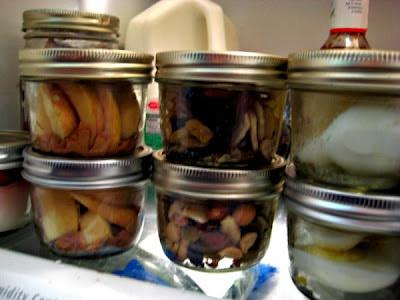 The thing I absolutely LOVE about salads and snacks in jars is that the salads are WAY better than the ones I slap together really quick at lunch time in the middle of a packed day. When I do the salads in a jar, I get to choose my salad type, make homemade dressings and put in ingredients and lettuces that usually languish in my fridge (if I even remember to buy them in the first place). There is WAY less food waste too, and everything is used and packed while still super fresh. This week Mr. Measure and I are enjoying 2 new salads, and one of our favorites. The Chicken Caesar is just dressing (I like Newman's Own Creamy Caesar). I measured a serving of that into the bottom of the jar, then added cooked chicken, olives, tomoatoes, feta, and stuffed in as much mixed lettuce as I could. The 7 Layer is the classic church cookbook recipe with the homemade mayo dressing with curry (recipe below). Then you layer in everything else you can think of. This week I added chopped water chestnuts, peas, carrots, mushrooms, tomatoes, crumbled bacon, hard cooked eggs, and stuffed with mixed greens. And my favorite this week is this new recipe fresh spinach salad with raspberry vinaigrette. SO delicious! The dressing recipe is from Penzy's spices (I got a free bottle of their "Raspberry Enlightenment" --which is basically soft raspberry jam, so you can substitute with any kind of preserves or low sugar jam). 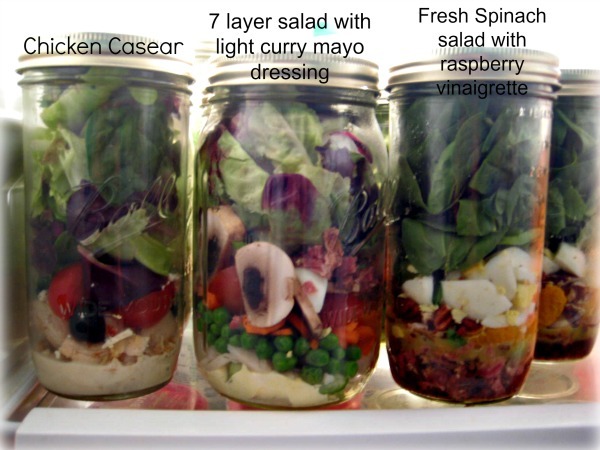 It is a delicious salad and I can't wait to try different variations! This one has the vinaigrette, bacon bits, mushrooms, hard cooked eggs, canned mandarin oranges, chopped pecans, and loads and loads of spinach. As usual, I remove about half the lettuce, re-cap, shake well, and dump. The snack section of our fridge this week features fruit and yogurt, hard boiled eggs, apples and peanut butter, and homemade trail mix with mixed nuts, raisin medley, and dried banana chips. Shake until mixed well and pour 2-3 Tbs in bottom of each jar. Love it! Thanks for the recipes!!! I need to do this sooo bad for me AND my poor husband who never remembers to take a lunch to work.